MIT and Harvard University researchers have found a two-dimensional material whose properties are very similar to graphene*, but with some distinct advantages — including the fact that this material naturally has a usable bandgap, which is essential for making devices such as computer chips and solar cells. 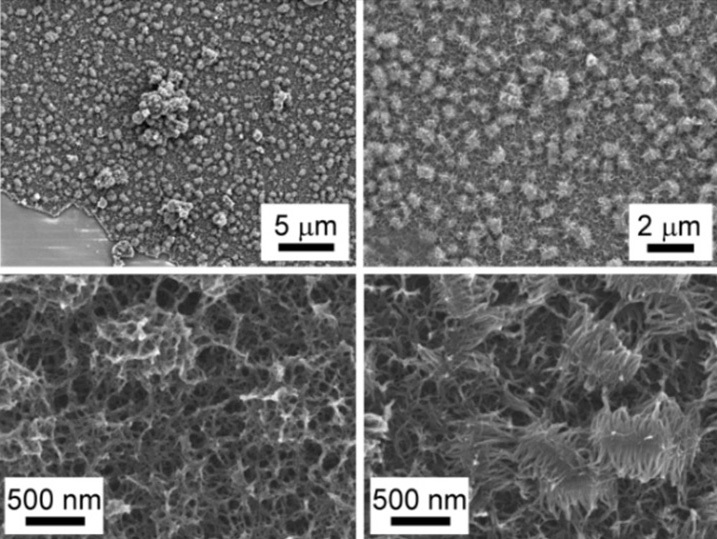 The new material, is a combination of nickel and an organic compound called HITP. Its constituents also naturally assemble themselves, a “bottom-up” approach that could lend itself to easier manufacturing and tuning of desired properties by adjusting relative amounts of the ingredients. The new compound, Ni3(HITP)2, shares graphene’s perfectly hexagonal honeycomb structure. What’s more, multiple layers of the material naturally form perfectly aligned stacks, with the openings at the centers of the hexagons all of precisely the same size, about 2 nanometers (billionths of a meter) across. The research, just published online in the Journal of the American Chemical Society, was carried out by MIT assistant professor of chemistry Mircea Dincă and seven co-authors. In these initial experiments, the researchers studied the material in bulk form, rather than as flat sheets. Dincă says that makes the current results — including excellent electrical conductivity — even more impressive, since these properties should be better yet in a 2-D version of the material. Such materials, Dincă says, might ultimately lend themselves to solar cells whose ability to capture different wavelengths of light could be matched to the solar spectrum, or to improved supercapacitors, which can store electrical energy until it’s needed. The work was supported by the U.S. Department of Energy and the Center for Excitonics at MIT. * Graphene has extremely good electrical and thermal conductivity, as well as great strength. But its lack of a bandgap forces researchers to modify it for certain uses — such as by adding other molecules that attach themselves to its structure — measures that tend to degrade the properties that made the material desirable in the first place. Reaction of 2,3,6,7,10,11-hexaaminotriphenylene with Ni2+ in aqueous NH3 solution under aerobic conditions produces Ni3(HITP)2 (HITP = 2,3,6,7,10,11-hexaiminotriphenylene), a new two-dimensional metal–organic framework (MOF). The new material can be isolated as a highly conductive black powder or dark blue-violet films. Two-probe and van der Pauw electrical measurements reveal bulk (pellet) and surface (film) conductivity values of 2 and 40 S·cm–1, respectively, both records for MOFs and among the best for any coordination polymer.